Magnificent at the back of the border and for cutting or naturalizing. Very striking, bold upright spikes are dense with pea-like flowers in intense blues to creams. Best placed at the back of the border for cutting or naturalizing. Stately 3' spikes in wide color range and many lovely bicolor, bloom from May to June. Attractive foliage. Prefers cool weather. Direct sow in spring after danger of frost in a sunny location with well-drained, moist, slightly acidic soil. Sow where plants are to remain as they do not transplant well. Sow seeds ¼ inch deep. Seedlings will emerge in 14-28 days depending on soil and weather conditions. 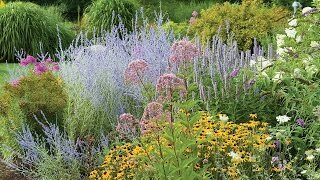 Plants bloom in summer, but if you cut the spent slower stalks back after blooming, the plants may reward you with a second flush of bloom in late summer or fall. Lupines are cool season plants that are at their best in areas with cool summer nights. 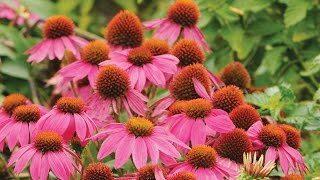 These spiky plants are dramatic at the back of the border and beautiful for cut flowers. They naturalize well in wildflower meadows. The flowers attract hummingbirds and beneficial insects. Lupine, Russell Hybrid Mixed Colors is rated 4.4 out of 5 by 8. Rated 3 out of 5 by Gardening with corgis from Plants a great option in lieu of seeds! I like the option to get plants delivered instead of seeds. Plants arrived slightly damaged, but I thought that might be normal until I received plants from another company that looked much better upon arrival. Burpee plants pictured on the left. Rated 3 out of 5 by Smac from Still waiting on blooms Nicked the seed and cold shocked them in refrigerator for a week before Spring planting. Like a lot of reviews so far just leaves. Hopefully something comes up this year. Rated 5 out of 5 by Bogey from stand out plant. I planted Russel lupines from one seed pkg. ten or so years ago. I did get some first year blooms, but mostly got tons of small rosette type plants that grew up the following year. This continued until a landscaping co. sprayed with 'Round Up', and killed most everything. I will try again to start the cycle of seed-reseed. I would call this plant a biennial. Well worth planting. Rated 5 out of 5 by TanyaM from Great Flowers I loved the way these looked and stood out from the traditional flowers on my street. They were a conversation starter with my neighbors while I was working on my yard. Can't wait to see how they come up again next year! Rated 4 out of 5 by CaitlinsCrops from Pretty Foliage I established a raised asparagus bed and planted the lupines infront. I've been fertilizing the asparagus so much I think I cursed my chances at blooms this year. Interesting looking leaves, but I'm excited for blossoms next year! Rated 5 out of 5 by LynsyS2002 from I love these! Lupines are so easy to grow, and really beautiful! I grew up in Atlantic Canada where lupines grown wild along the highways. I'm so excited to have some in my backyard to remind me of home :) I am planting them along our chain link fence to spruce it up a bit! Rated 5 out of 5 by cjhetland from Lupine Russell Mixed Coplors Hybrid Super easy, quick growing - growth from seeds was incredibly fast. Do not try to transplant after planting. They have long roots so plant outside - not in a planter. Some Lupine are poisonous - so be careful concerning your pets and small children. Rated 5 out of 5 by Flower Fool from Lupine Russell This flower reminds me of an old time garden, I Love it.